Jared Kushner has never failed to choose blood over ideals. Kushner knows from immaculate polish, and his tentacles are stretching further by the day. Donald Trump’s 36-year-old son-in-law has now been tasked with bringing peace to the Middle East, destroying ISIS, reshaping the federal government, halting the opioid epidemic, and wooing China to our side. This would be an ambitious set of action items for a century’s worth of competent presidential administrations. Trump has handed the to-do list to a boyish cipher whose dad paid millions for him to get into Harvard. It shouldn’t be surprising that POTUS has presented his senior adviser with such an expansive portfolio. Chip away the glassy surface and no one in Trump’s orbit is more Trumplike. Charles Kushner’s son and Donald Trump’s daughter’s husband stands firm in his allegiances yet dons (and sheds) his beliefs like dinner jackets. As Andrew Rice noted in New York, Jared Kushner has never failed to choose blood over ideals. Jared Kushner meets with service members at a forward operating base on April 4 in Iraq. 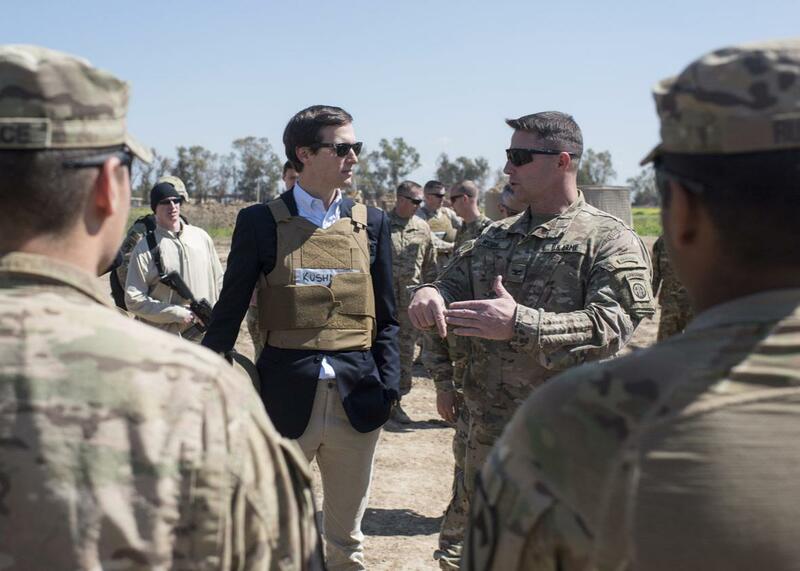 The shot, featuring Kushner in a blazer over which he’d fastened a bulletproof vest and a dorky name tag, fed into his greenhorn aura. Alongside the troops his presence endangered, he looked like a spoiled, silky-haired dilettante exploiting his family’s newfound position. 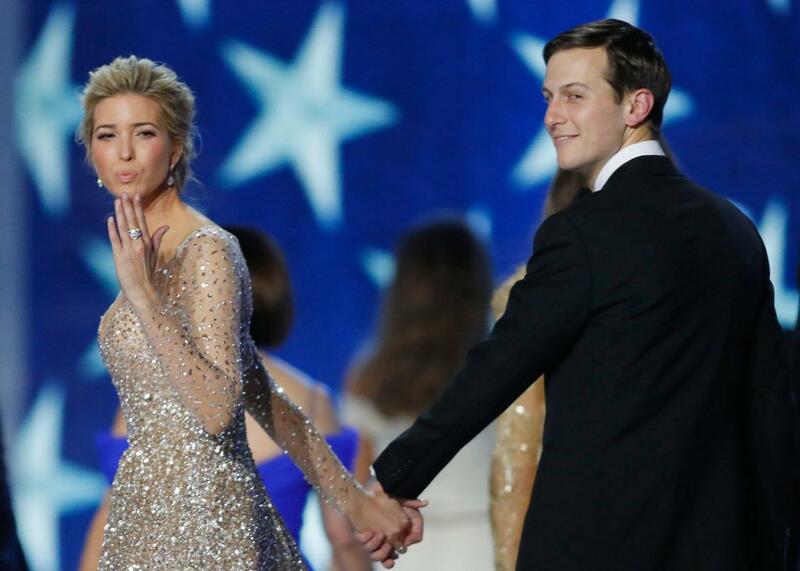 Another image, this one posted to Ivanka Trump’s social media accounts, showed Kushner and his wife decked out for a black-tie affair the same night their fellow Americans poured into airports to protest the president’s Muslim ban. Ivanka and Jared came across as out of touch and callous: Kleptocrat Barbie with Complicit Ken on her arm. Kushner’s tailored suits, we’re told, hide a pair of sharp elbows. After the election, Forbes described him as the mastermind behind Trump’s winning digital strategy, a Silicon Valley–style disrupter who worked marketing magic with no staff and no money. More recent profiles have adopted a customized-for-D.C. narrative, suggesting Kushner’s lily-livered, soft-voiced façade conceals a burning ambition. He’s always been aggressive, staking the Kushner family fortune on a risky deal to headquarter his real estate business at 666 Fifth Ave. He made the impetuous choice to buy the New York Observer (canceling a trip to Germany to submit his $10 million offer) and then gutted its newsroom, chasing out every trace of left-wing toniness, overhauling the company’s success metrics, and making the business profitable. Perhaps Kushner is less a clueless rich kid treating the government like a toy than a ruthless hustler who regards the nation as his personal startup. Even if you buy that line, it’s undeniable that the prince of Trumpland has a penchant for severing his former attachments, often with savage efficiency. When Manhattan Democrats who’d lashed out at Kushner for backing Trump apologized after the election, he allegedly deleted their conciliatory emails. Elsewhere, he characterized the jettisoning of disloyal friends as “an exfoliation,” which removed all doubt that he could make a convincing Patrick Bateman come Halloween time. Media outlets sympathetic to Steve Bannon have also charged Kushner with leaking incriminating stories about his rival to MSNBC. (Swamp chatter suggests the sabotage flows both ways.) In Kushner, it seems, the endlessly flamboyant Trump has discovered the yin to his yang: an ice sculpture whose restraint appears less the product of diffidence than discipline. Those close to the administration offer up Kushner as one of two choices for a mercurial president. Trump can either follow Bannon down a garden path of reactionary white nationalism, or he can listen to his son-in-law, the scion of big Democratic donors and a voice for centrism. Kushner symbolizes the “open-minded” option in this scenario—my colleague Michelle Goldberg calls him an avatar of “normal conservatism.” Yet while Kushner’s coalition of business-minded moderates may advocate reaching across the aisle and extending our ambit around the globe (and thus traipsing through more traditional arenas for the GOP), the man himself turns inward at every opportunity. The ideologically driven Bannon will defend anti-immigrant, America-first isolationism even if it damages his personal relationships. Kushner amputates any belief or individual that comes between him and his most trusted allies. He is the most purely tribal counselor on Trump’s team. Consider the stupendous absence of dogma guiding the president’s right-hand man. Kushner, like Trump, used to vote Democrat. He is an Orthodox Jew who championed his father-in-law after he tweeted an image of Hillary Clinton alongside a star of David emblazoned with the slogan “Most Corrupt Candidate Ever!” In an editorial rife with “I know him”–ism, Kushner sidestepped the Trump campaign’s clear record of bigotry. “My father-in-law is an incredibly loving and tolerant person,” he wrote. Back in October, the Observer posed a question to the movers and shakers of the city’s real estate industry: Hillary or Donald? Kushner answered “family first.” It is his animating principle, the skeleton key to his business and political deal-making. He grew up in a fiercely loyal clan that flourished in large part because it understood that city councilmen and big-league developers made good bedfellows. Sometimes that coziness went too far: In 2005, Charles Kushner pleaded guilty to 18 counts of illegal campaign contributions, tax evasion, and witness tampering. (He’d attempted to blackmail his sister by hiring a prostitute to seduce his brother-in-law, who was planning to deliver incriminating evidence to a judge in federal district court.) Charles was dealt a two-year prison sentence, just more than half of which he served. Jared, then in his mid-20s, traveled to Alabama every week to see his father in federal prison. For most of us, choosing family doesn’t mean forsaking our friends or core beliefs. But Kushner, the Harvard-educated creature of polite, liberal Manhattan, had to pick between distancing himself from his father’s actions and doubling down on the Kushner name. As a Trump, he’s been forced to make that same decision a second time. His answer hasn’t changed. He is nothing more or less than a Kushner and a Trump. Kushner has said that Charlie’s conviction scuttled his plans to become a prosecutor. “Seeing my father’s situation, I felt what happened was obviously unjust in terms of the way they pursued him,” he explained in a 2014 interview. “I just never wanted to be on the other side of that and cause pain to the families I was doing that to, whether right or wrong.” He stopped worrying about right or wrong and bought the Observer, a media outlet he hoped would let him punch back at the press that had scorched his dad. According to a former Observer editor quoted anonymously in Vanity Fair, Kushner “attempted to order takedown pieces on people who had crossed his family in their business dealings.” (During Trump’s presidential run, articles criticizing Marco Rubio and New York Attorney General Eric Schneiderman hinted that the owner was up to familiar tricks.) He also took control of his parents’ real estate company, liquidating their New Jersey assets to purchase a glamorous Fifth Avenue office tower for $1.8 billion. The money-sucking investment has since become an albatross, but it served its symbolic purpose. It announced that the younger Kushner wouldn’t just stand by his family name. He would plate it in gold. In the Trumps’ palace intrigue, Kushner supposedly plays the tempering force. He is thought to draw Trump back; Bannon is thought to radicalize him. But Kushner is the octopus, known for its embracing arms. Creatures like him, no matter how reasonable they seem, never modulate their kin. They enable them.